As promised Intel has formally introduced its new family of 8th generation processors on August 21st exactly at the time of the solar eclipse! What is Intel Actually revealed? If you are going to buy a new Laptop before the start of 2018 Intel has good news for you! 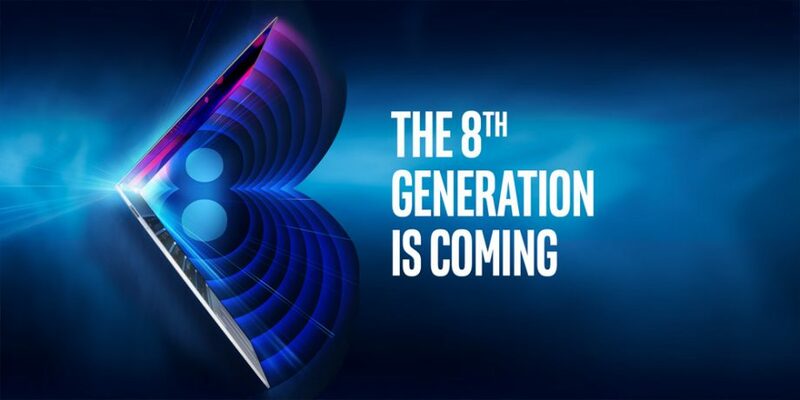 according to the Intel’s official announcement, 4 chips of the 8th generation U-series is gonna be on 80 Laptops that release before the start of 2018. Intel promised that the new chips are 40% faster than the previous generations. The U-series are the most common chips on the Ultra thin Laptops and light notebooks, but what makes Intel say that they are 40% faster than their equivalent models in the last generation? As you might know, the last generation U-series has the dual-core architecture, In the 8th gen Intel has doubled the number of cores and introduced the Quad-core chips for U-series. But there are more parameters than just number of the cores, The U-series chips tend to be low-power processors. The first new chips will be running on a refined version of Intel’s previous generation architecture called the “Kaby Lake”, This tells a part of the story. As you can see in the following picture while there are 2 more cores in the new chips the base clock speed is much lower than the equivalents in the previous generation! For example, the Core i7-7600U started at 2.8GHz while the new i7-8650U can run as low as 1.9GHz, and that makes sense because Intel added 2 cores to a chip with the same thermal design power (TDP) as the last generation, This means that some of the cores will not be running with their potential all the time. We don’t have much information about the details of the 8th generation desktop chips code name “Coffee Lake”. Intel will launch its 12-core processor later this month and you can buy it with 1200$, And it will keep releasing 14-core, 16-core, and 18-core processors within the few remaining months of 2017 with the price of 1400$, 1700$, and 2000$. The 8th generation processors will require the Intel’s large “LGA 2066” processor socket so if you are thinking to buy one you may consider buying a new motherboard as well.